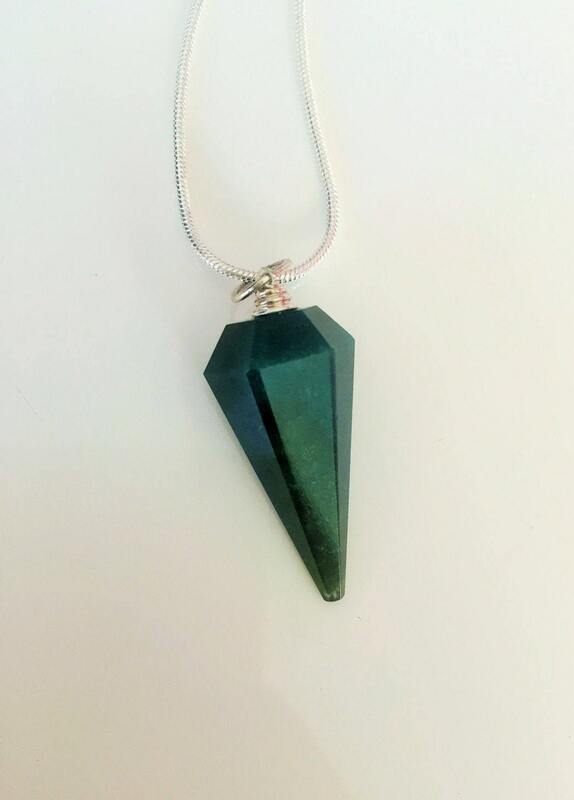 Green Aventurine Pendulum Necklace is connected with the Earth element. It is a stone of good fortune bringing abundance and luck. Place these above your business cards, in your studio or work place and see your business grow. Listing includes a similar pendant in the pictures. 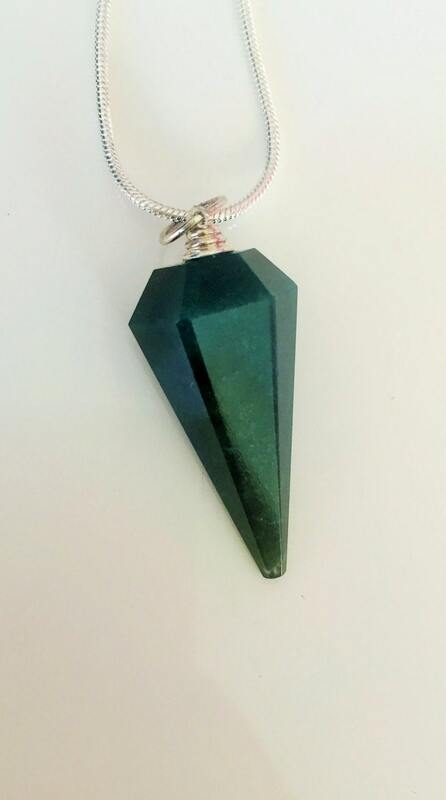 Pendulums are 6-sided with a silver chain. The pendulum measures 1.5"-2" long. Select CHAIN size during check out. Chains measures between 18" - 22 inches in length and 1.5mm thick with a silver lobster claw closure. Arrives in a silver cotton filled gift box. 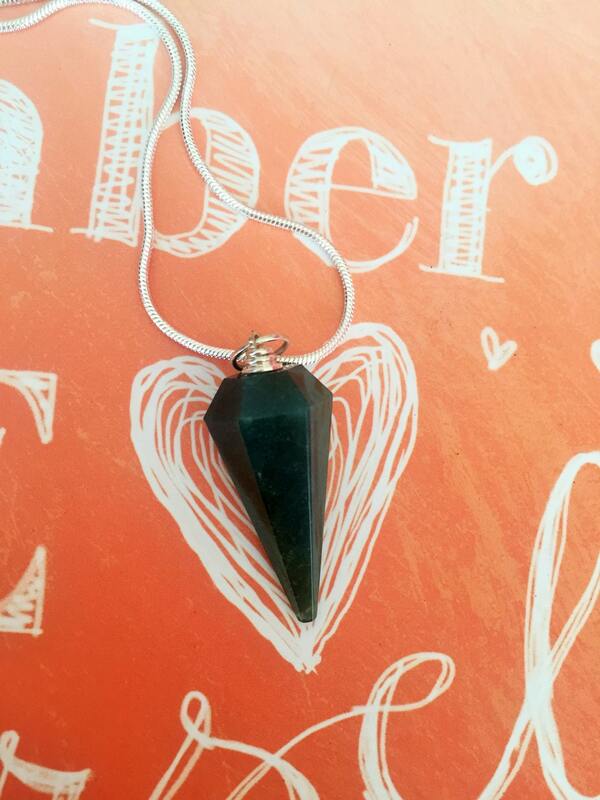 Want to see our collection of healing jewelry? If you'd like your order to be pushed to the front of our current orders, please include this "Rush My Order" add-on with your purchase. To ensure your package arrives on time and in perfect condition. Yes. Please email me for inquires. All our crystals and stones are bubble wrapped or placed within a cushioned gift box/bag. ALWAYS!!! Do you combine shipping cost? Time and care is necessary to pack these treasures to survive the trip through the postal system. However, if you would like to purchase more than a few of the exact same items please contact me by using "request custom order". How do I know the size? Please read the description, measurements , and view all photos before purchasing. If you have any questions before purchasing please feel free to ask, but all the information is there on the listing. Also if you have a ruler you could take a look at that too, so if a stone says it is 25 mm or 1 inch long, you could look at your ruler and see how big that is. Once an order is placed I cannot refund a coupon code you may have forgotten to use ♡ I do apologize! Great Seller; Absolutely Amazing!! Thank You! !